Six month of urban research on the area were followed by a master design project, covering aspects of contemporary planning as diverse as airport connectivity, traffic infrastructure, landscape design and architectural detail. The above slides give a brief introduction of a possible urban development of the area. The underlaying strategies and rules are explained below. Despite being a useful vehicle for interpreting the airport to city axis, the Airport Corridor has struggled to develop beyond a conceptual and marketing tool. As such, it has produced poor urban spaces. Our project evolves the concept into a coherent spatial strategy that ensures resilient future development. The airport corridor only exists as a theoretical concept. In reality, the area is fragmented into enclaves among infrastructure swaths. The potential of the Airport as a global node with enormous business power cannot unfold. Also, the unique recreational qualities of this area are only hardly accessible, even though they are situated at Amsterdam's door step. 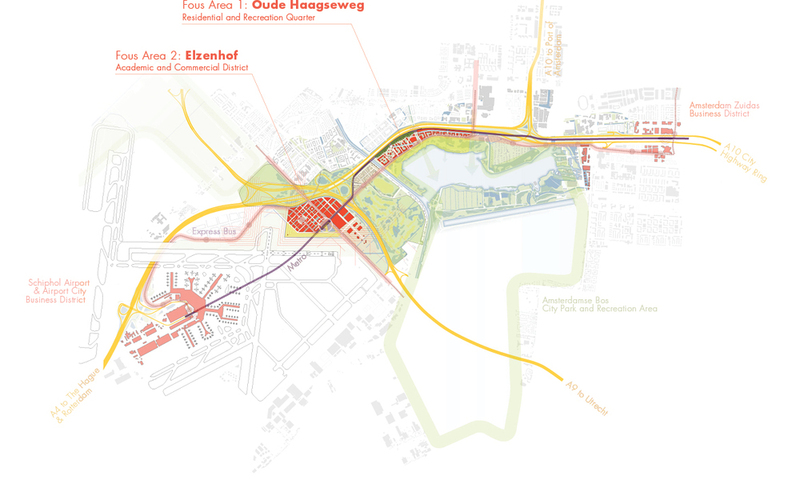 The Airport Corridor can be the next city extension of Amsterdam. The city has a long tradition of ambitious growth plans, the last of which have focused on the Eastern areas. With the unparalleled potential of the airport, and an excellent infrastructure already in place, a new extension towards Schiphol is the logic next step. Our design aims to ensure a resilient development that provides the best possible environment for businesses, residents, recreation seekers and travellers alike. The Airport Corridor area is currently disconnected from the surrounding urban fabric, underutilized, and characterized by dead-end situations. We propose a strategy that reconnects our perimeter site with the existing urban spaces on different scales and levels. Our proposal aims to complement the nearby airport, as well as the growing Amsterdam. The Urban Design is based on a set of four rules that guide future development.